Come Durga Puja and the whole of Kolkata, in fact West Bengal is soaked in revelry. 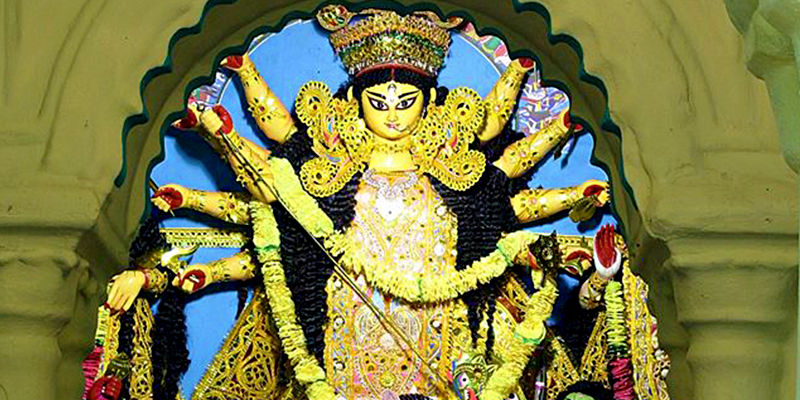 However, Durga Puja in West Bengal is not just limited to its metropolitan city. 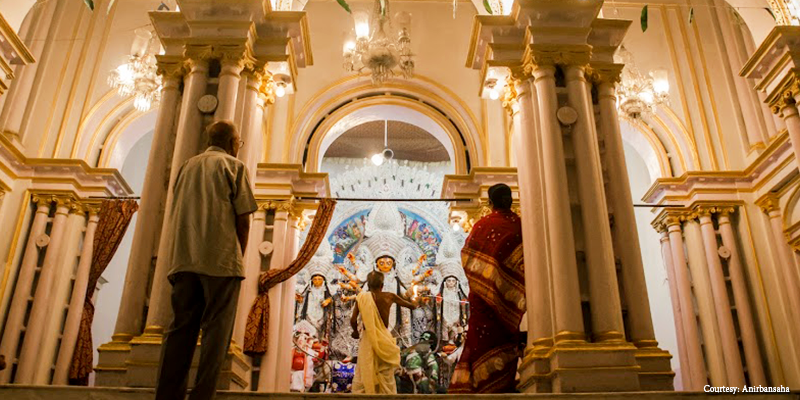 While the Sarbojonin (or for all) Pujas of Kolkata steal the show with their pomp, glory, crowd and money, it is often the old bonedi (or family) pujas in small towns that follow the strict rules of this festival. Celebrated in relative calm, following the strict dictum of rituals, the bonedi pujas are the reminiscences of old Bengal. 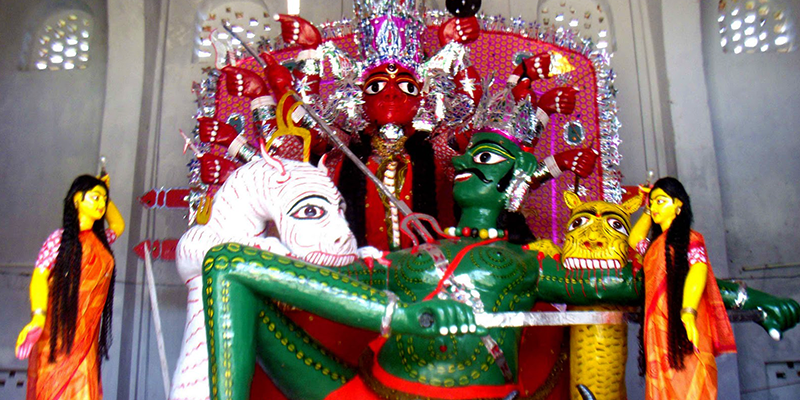 So, we bring before you some of the oldest bonedi Pujas in various parts of Bengal. Families that are known for their bonedi puja belonged to the ruling Zamindar class or the rich trader’s families, during the Raj days. 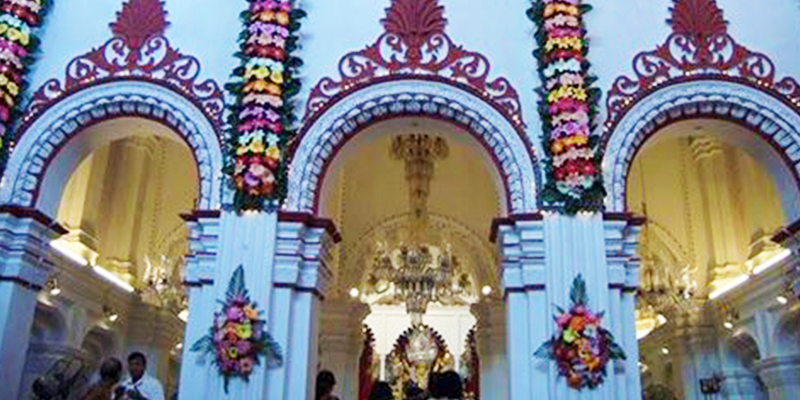 Such traditional puja is held mostly in the Thakur Dalan (or central courtyard between the row of rooms situated right in the middle and visible from all sides). Idols for such pujas are made within the Thakur Dalan and in most cases; the artisans have been working for generations. The work for a new idol starts on the auspicious day of “Rath Yatra”. Generally, the traditional idol is “Ek Challa” or within one frame, unlike the idols in big “Sarbojonin” pujas which tend to have the Goddess separate from her children – Kartika, Ganesh, Lakshmi and Saraswati. The drawing of goddess’ eyes is very special; the artisan will generally fast or eat vegetarian dishes before drawing the eyes on Mahalaya. Known as “Chakhudaan” this ritual is very strictly followed in such households. If the family is a non-Brahmin, they will most probably not offer cooked rice dishes as “bhog” or “prasad”; and in many cases, this cooking has to be done or supervised by a Brahmin wife. Situated on the other side of river Bhagirathi, Howrah has its fair share of “bonedi” pujas as it was the hub of successful Bengali traders who built their palatial mansions here during the British Raj. One of the oldest puja here is held at the ancestral home of Dutta Choudhury’s who can trace their lineage to the 5 Kshatriyas said to have come to Bengal at the start of Sen dynasty in Bengal! This 400+ year old puja in Andul is older than the famed Shovabazar Rajbari Puja (the most prominent “bonedi” puja in Kolkata). Unique Custom: The warrior heritage of this family is reflected in their unique ritual of sacrificing a humanoid figure called “Shatru Boli” (sacrificing the enemy). This 400+ years old puja is held in the Roy Choudhury zaminder family. There is a lot of uniqueness about this puja. Here, Goddess Durga is worshipped alongside the family deity of Batai Chandi (Chandi is another incarnation of Goddess Kali) through the five days. Unique Custom: Though banned and restricted elsewhere, the Roy Choudhury Bari’s puja still performs animal sacrifices as a custom. 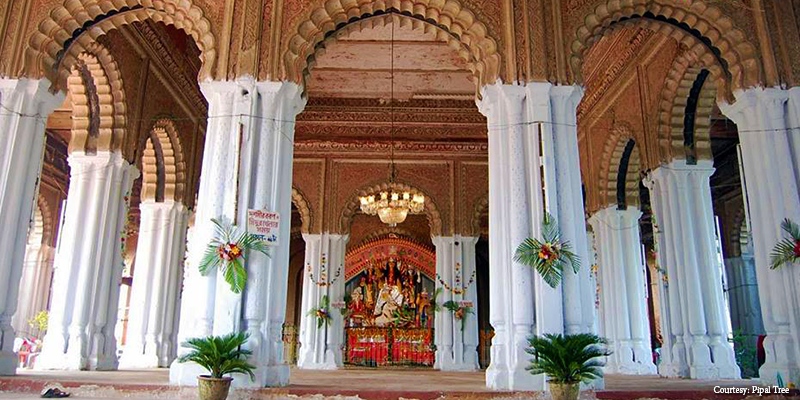 The Andul Raj Bari puja has been celebrated for many centuries now. Original Roy family who hosted the puja were the rulers of this area. The family started their journey with Ramlochon Roy who was a trusted lieutenant in Robert Clive’s army. However, the present day puja is hosted by the Mitra family, as the original Roy lineage died. Some decades back, an unforeseen incident (that happened during the puja) stopped it for about 150 years but the present generation have revived their Bonedi puja. Unique Custom: The Goddess is not housed in the main Raj Bari building; but in an adjacent “Thakur Dalan”. 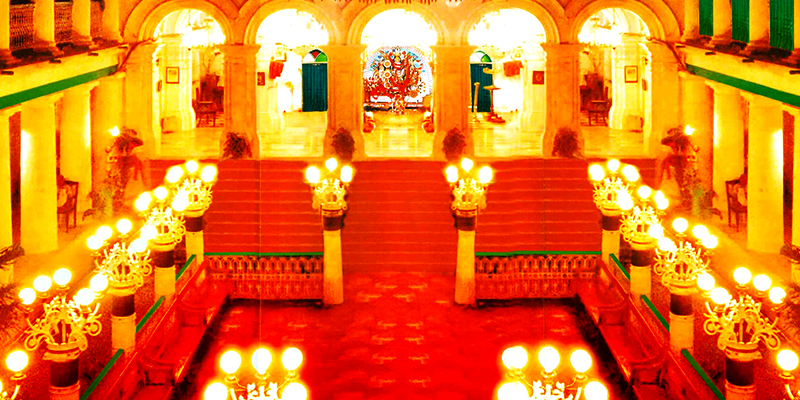 The Durga Puja was started by the Maharaja of Krishnanagar about 400 years ago. Today, this is the location for two heritage pujas, the second one being started by the Maharaja’s daughter. The unique goddess here rides on a horse rather than the traditional lion. Unique Custom: A Neelkantha (Blue jay) bird is released before the Goddess is taken for immersion. It is one of the rare pujas which still upholds this age old custom. Moving towards the North, one of the famous Bonedi Pujas in this part of Bengal is held at Cooch Behar Raj Bari (500 year old puja). Though the royal family is not hosting the puja anymore, a trust was created some years back to organize the puja every year. Goddess here does not have her sons and daughters as companions, but rather it is Jaya and Bijoya who accompany her. The idol is housed in a permanent temple called Debi Bari. Her carriages are both lion and tiger. Unique Custom: The idol has both lion and tiger as her carriage. 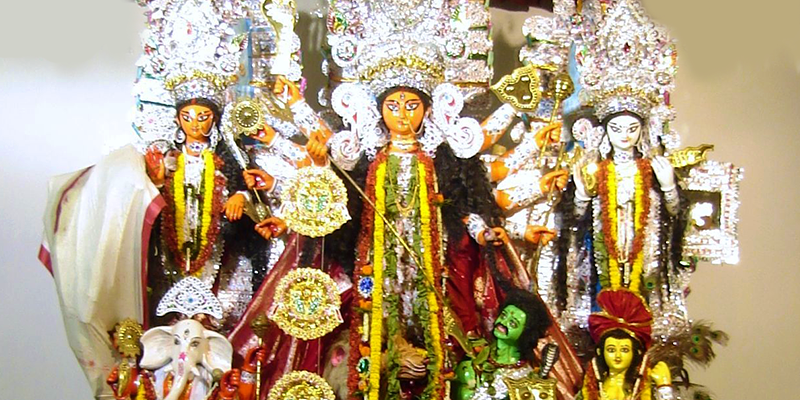 So, take a tour through these historic Bonedi Pujas of Bengal and relive the ancient glories. What is the connection between firecrackers and Diwali? “Look at the tradition of Durga Puja in Bengal, which seems like an old and venerable tradition. In reality it goes back less than three centuries “ Some families have been doing the puja for 4–5 centuries!